Over 400 peripheral neuropathy lawsuits are now pending against the manufacturers of Levaquin, Avelox and Cipro in the federal litigation underway in Minnesota. On March 1, 2016, the federal litigation issued its third Pretrial Order,which set forth procedures for the use of Master Pleadings. Among other things, the Order stipulates that the Plaintiffs' Steering Committee must file a Master Complaint with the Court by April 14, 2016. Any Plaintiff with a case pending in the multidistrict litigation as of that date must file a Short Form Complaint by May 14, 2016. "Our Firm has heard from a number of individuals who allegedly suffered permanent nerve damage due to their use of a fluoroquinolone antibiotic, and we are not surprised that the federal litigation has grown to include more than 400 cases. The Court's decision to allow the use of Mater Pleadings will allow these proceedings to move forward more efficiently," says Sandy A. Liebhard LLP, a partner at Bernstein Liebhard LLP, a nationwide law firm representing victims of defective drugs and medical devices. The Firm is offering free, no-obligation Levaquin lawsuit reviews to patients who were diagnosed with peripheral neuropathy that could be associated with the use of a fluoroquinolone antibiotic. Peripheral neuropathy is a form of permanent nerve damage that affects the nerves responsible for sending sensory information back to the brain and spinal cord. The condition was first noted on the labeling for fluoroquinolone antibiotics in 2004. However, in August 2013, the U.S. Food & Drug Administration (FDA) ordered fluoroquinolone manufacturers to modify their product labels to warn that peripheral neuropathy may occur soon after these drugs are taken and may be permanent. The multidistrict litigation underway in Minnesota was established last July to allow federally-filed cases involving Levaquin, Cipro and Avelox to undergo coordinated pretrial proceedings. Plaintiffs who have cases pending in the District of Minnesota accuse the drug's manufacturers of failing to adequately warn doctors and patients about the potential for serious nerve damage and peripheral neuropathy. They further assert that they could have avoided these debilitating complications had better warnings been available. Patients who developed permanent peripheral neuropathy that may be related to the use of a fluoroquinolone antibiotic could be entitled to compensation for medical bills, lost wages, pain and suffering, and more. 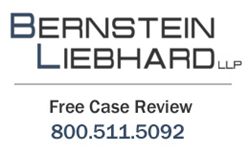 To learn more, please visit Bernstein Liebhard LLP's website. Free, no-obligation legal consultations can also be obtained by calling 800-511-5092.